INTEREST in Lower Wonga continues to flare up with a pitch made for a second solar farm to be built in the area. 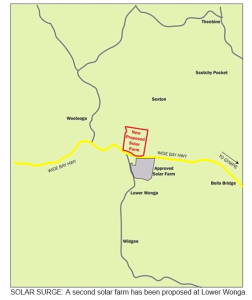 Called the Woolooga Energy Park, the proposal involves building a 185 Megawatt energy hub on 415ha of land. Construction of the park is expected to take one year with an estimated 120 jobs (and the potential for 80 more) to be created during this stage. The park would front a 2km stretch of the Wide Bay Highway. It would be connected to the substation across the road by cable which developers LGI Limited said was a key part of the chosen location. Battery storage is also possible on the site. LGI said the solar panels would be set back from the road, with landscaping to provide a visual buffer. No vegetation is proposed to be cleared. The solar panels will face north-south and away from the highway, with LGI saying they do “not believe there would be glare or sun strike issues to drivers”. While the panels will be visible, LGI said they were designed to absorb light, not reflect it. 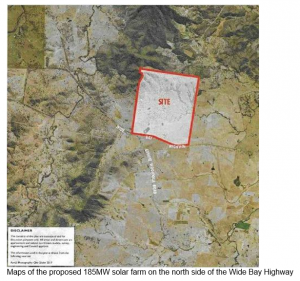 “Whilst the array will be visible it is not expected to generate significant glare concerns,” they said. More than 490,000 solar panels are expected to placed at the park. They would cover about 75 per cent of the site, with the rest of the land for grazing. LGI said the intersection of the access road with the highway would need to be upgraded. 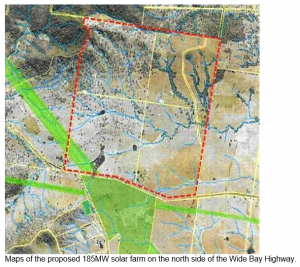 The park is proposed to sit directly opposite 1000MW Gympie Energy Hub solar farm being built by SolarQ.